Cleaning Up Garage for Valentines Day and Need A Skip Bin? Welcome to February and we are only two weeks away from a very romantic celebration in our wonderful state of Victoria - a Valentines Day, where couples are making gifts for each other and unsurprisingly enough one of the gifts in the married households is a gift of decluttering! Sometimes less is more and in a case of junk and clutter - clearing this out of your house and / or garage can not only shift the clear the energy around your house but also make your partner extremely happy. Last Valentines Day, a couple of ladies from Bayside, Vic have converted their husbands mess of a garage into a dream-like man's cave, with the help of only a tiny 2 cubic meters bin, to throw away all unused and broken junk. In another example - our customer from Cheltenham has cleared all the junk from his back yard, to create a space for his parterns raised garden bed. For this project he required a 3 cubic meters walk in bin, to get rid of some excess soil in a back yard, a number of boulders, which were taking space and a number of broken flower pots, old unused kids toys and broken bikes, which were cluttering the back yard. 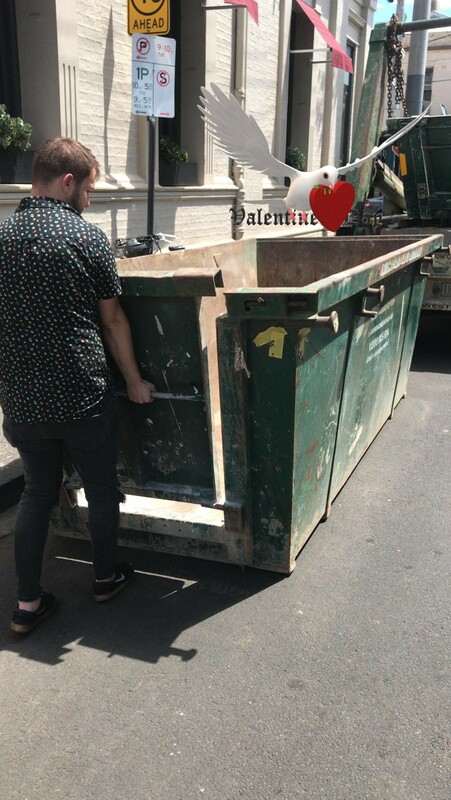 No matter what decluttering or space clearing project you are planning, from Garage Clean Up to Back Yard or Patio Clean Up or storage cupboards decluttering, we have the right size skip bin for you for all various waste types, delivered Monday to Saturday with an extremely easy bin booking process and the friendliest customer service and skip bin drivers in Melbourne! Our Skip Bins come in all sizes, from the smallest 2 cubic meters bin, suitable for your smallest projects and all the way up to 31 cubic meters bins, which are ideal for a variety of projects, inclusive of moving parents to an aged care facility and clearing up their property, to warehouse and end of lease clean ups to Demolition Projects site clean ups. Whatever your bin requirements are - we are here to help you select the right size and type of bin, which will be ideal for your project. Give our friendly team a call on 1300 605 624 Monday to Friday from 7am to 5.30pm and on Saturday between 8am and 12pm. If you prefer to obtain an instant skip bin quote and organise booking online - we have the friendliest and easiest online bin booking process via our secure website, where you can obtain your bin quote and booking in under 3 minutes, with invoice being automatically emailed to you. If you have decided to surpise your significan other for Valentines Day by clearing up or decluttering their favourite place in or around your house then we are here to help you! We look forward to speaking to you soon!